So you are engaged to the man or woman of your dreams and you’re planning the big day… the task of picking out a wedding dress can be a rather daunting task, especially if you are looking for something vintage inspired! Wedding dresses are one of things that you kinda want to try on first but let’s face it, it can be hard to find vintage or vintage inspired dresses locally and buying online is a little scary! 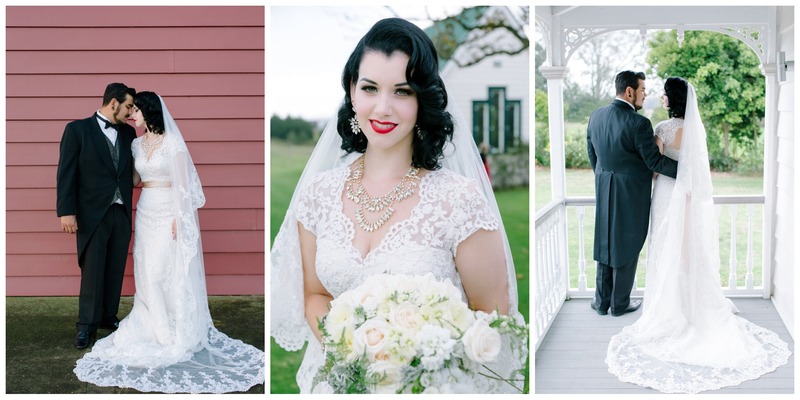 Here is the start of a three part series with some ideas of where you can find your perfect pinup wedding dress, I did A LOT of internet surfing when planning my wedding. I had originally just planned on doing one post on this topic but I’ve since decide to split it into 3 to properly cover everything! First up is the traditional long dress and Part two and Three will cover Tea Length and a the budget friendly. Your are guaranteed to need to spend more money on a long dress unfortunately. Also bear in mind that drycleaners will charge you a ridiculous amount just because it’s a ‘wedding’ dress… and with a long white lacy gown, there’s no way you can deny what it was for. 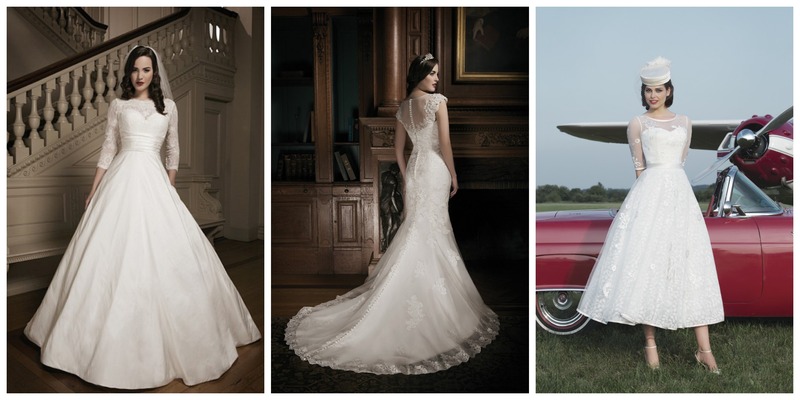 Maggie Sottero is a lovely brand of traditional long wedding dresses with vintage inspiration. I tried on a Maggie Sottero just a few days after we got engaged, at the Unique Vintage store in Burbank, California. Here is the stunning Jessica of Pin up Persuasion in her Maggie Sottero! For those in New Zealand, Astra Bridal is a reseller but bear in mind that it can take up to 5 months for them to order a dress for you, so don’t leave it too late! Justin Alexander is another brand that I found on my hunt for the perfect wedding dress. Founded in 1949 in Brooklyn, New York, the range is vintage inspired with lavish lace, beading and stunning silhouettes. There are a couple of tea-length options which is great to see! I also absolutely adore their accessories range! They have the most amazing shrugs, caplets, jackets and belts, if you are on a budget, you could buy a cheaper dress and really glam it up with one of their tops. Justin Alexander is not sold anywhere over the internet, you can only buy from their authorised resellers. Because of this, it’s very hard to find prices but from memory, their prices were significantly more than Maggie Sottero. I remember being quoted about NZ$3000 from a boutique in New Zealand. If you are able to go into a local bridal shop to try sizes on, you could always buy from www.preownedweddingdresses.com. There are over 200 listings for Justin Alexander and over 1300 for Maggie Sottero! Check out the oh-so-beautiful Amy on her wedding day! She wore one of the Tea Length Justin Alexander and I love the added fur cape and birdcage veil! Blue Velvet Vintage is my go-to store for long, affordable vintage style dresses. I have two from them and for the price, I was happy with the quality and the details. 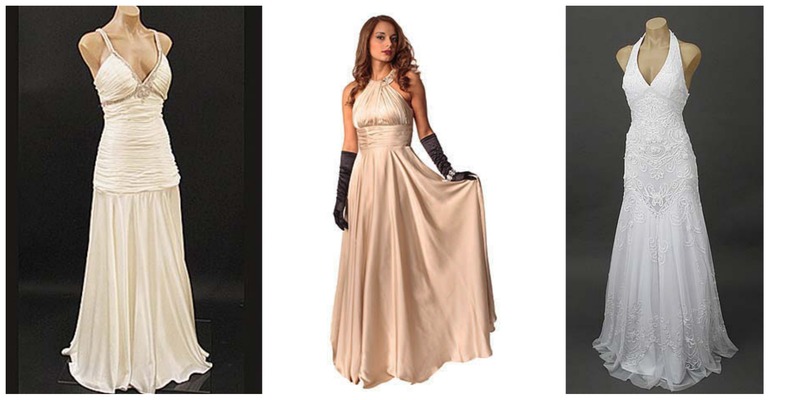 They have a range of bridal dresses with a distinctive 30’s style and are a great price! These three dresses range in price from US$120 to $179 so are very affordable! In my experience with Blue Velvet Vintage, the Customer service is always super helpful with determining a size and shipping, whilst being pricey, is very swift. The only thing about Blue Velvet Vintage is that most of their gowns only go up to a size 14 or XL depending on the manufacturer. So the range isn’t particularly plus size friendly. Gorgeous bride Kelly wore the ‘30s Old Hollywood Style Evening Gown‘ on her wedding day. I love the rhinestone detailing and that back is just to die for! For just US$159, it’s a total bargain! Whirling Turban is well known in vintage reproduction circles to be high- quality, made to measure couture. I have enquired about ordering a couple of times over the years and while I haven’t gone ahead with a order yet (one day I hope! ), I have always found the service incredibly helpful. They mainly have shorter styles but I had to include their stunning mermaid wedding gown. Cherry Dollface wore the polka dot one on her wedding day – and by the way, the ‘polka dots’ are actually tiny ribbon roses! 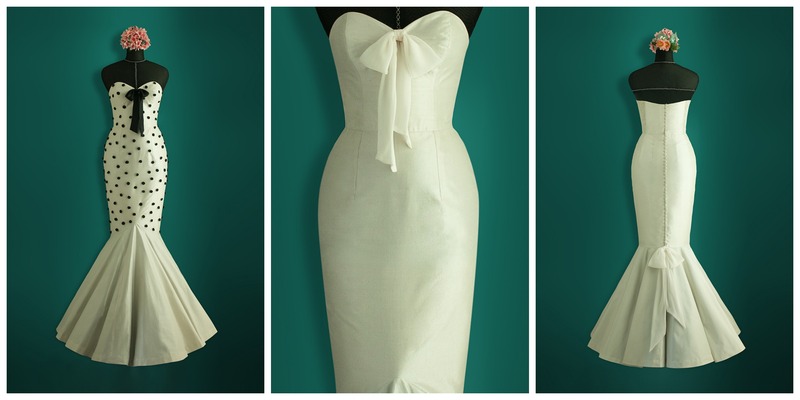 – and I think it just one of the most gorgeous 50s style wedding dress around. Starting at US$1850, this dress is true couture. You can order a ‘loaner dress (watch Cherry’s video of hers here and a video she made about how to measure yourself for a WT dress here) and they will coach you through the entire process. Featuring a boned bodice and your choice of colour of net under-structure underneath the flounce. You can also choose to add the bow on the front or back from either silk satin or silk chiffon. Below is the absolutely stunning Brittany! The subtle black details work wonderfully and it totally fits her perfectly! If you are lucky enough to be able to find your dream vintage wedding dress in your size, then it can be a extra special part of your day. There is always added meaning to a true vintage dress! Hunt around at your local vintage shops or keep an eye out on eBay or Esty. Make sure you know your proper measurements to avoid disappointment and start looking early to give yourself time to find the perfect dress. 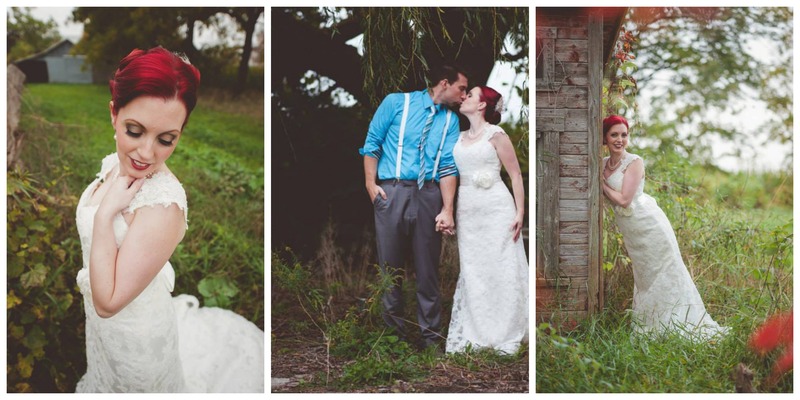 Amanda was able to wear her Grandmothers wedding dress and even replicated the photo! She did need to replace the zip and wear a corset to fit the 26″ waist but doesn’t she look amazing?! To make it extra special, her grandparents had just celebrated their 50th Wedding Anniversary when Amanda got married. One problem you may encounter with a lot of off the rack brands like Maggie Sottero and Justin Alexander is that they are standard sizing and not able to be custom made. When I was looking for my wedding dress, I decided to go down the custom-made route because the style I wanted was going to prove problematic for me to buy off the rack. I am about a size 10 on top and around a size 14 in my hips! Sure, I could have got the top taken in, but you can lose some of the shape and look of the dress with alterations as dramatic as that! I found a local bridal shop called Kelly Lin Couture that has samples to try on but makes every dress to order. I tried on a sample I liked the look of and was able to customise it to my liking. I added cap sleeves, the sash, altered the neckline slightly and raised up the keyhole back. They also made it to measure so it fitted perfectly through the waist and the hips! You can see more of my wedding photos in my series of blog posts here. This dress cost me NZ$2400 which considering it was made to measure and the ability I had to make it the perfect dress, I was happy with the price. Ask around your local bridal shops and designers and see if they can cater to your needs! Thank you to the lovely ladies who sent in their wedding photos! 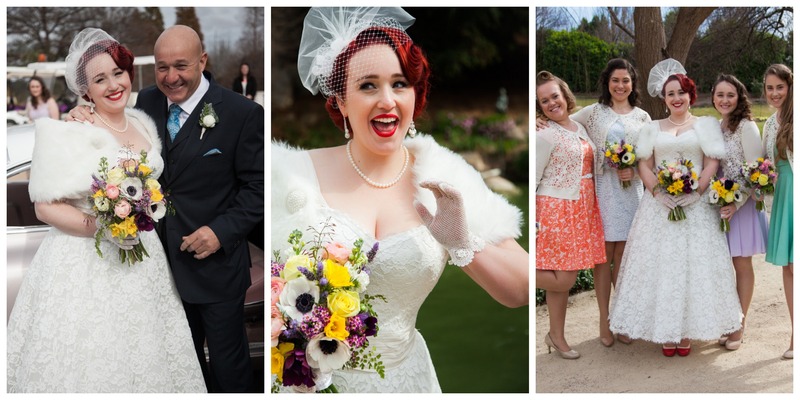 I love having ‘real brides’ included so readers can see how everyone has accessorised and made each dress their own. Tomorrow will be part two of the series- focussing more on Tea-Length styles! I loved looking at real wedding dresses, but at the end of the day, I’m happy I will have a dress that makes me look like a glammed up version of myself, rather than a Fran-pretends-to-be-fancy dress. There are some REALLY great stores that sell authentic vintage wedding dresses for very reasonable prices online – here are a few of my faves!